I hope you all had a wonderful Thanksgiving yesterday or just a lovely day if you don’t celebrate the holiday! Mr. Bunkycooks had to do most of the cooking since I am still gimping around on the silly knee walker while recovering from my ankle surgery. I was, however, able to make two pies (and paying for it today, I might add). Thankfully, I made cranberry sauce in advance, so that only required a move from the freezer to the fridge. Don’t you just love when that happens? This was a really big apple! 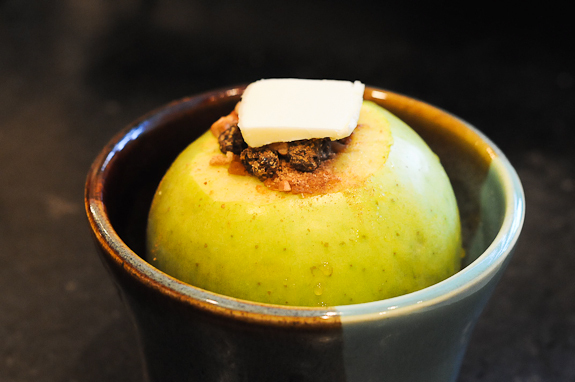 Anyway, if you have had enough of the pumpkin and pecan pie stuff (I know I have), here is a recipe for a simple and delicious Baked Apple. I could be on an apple obsession kick after the Green Appletinis! This is perfect for an easy dessert when you want something a bit sweet after dinner, but not a sugar overload or a bunch of calories…unless of course you top it with some Bourbon Whipped Cream or homemade Vanilla Ice Cream! I found this nifty and rather large handmade apple baker in a local artisan shop in Asheville, North Carolina. If you are not as fortunate to find one of these near you, either this apple baker or this one should do just fine. You want to be certain to have a good apple corer as well to make your life easier when taking out the center of the apple! You want lots of space for all the goodies you tuck in there. A big apple requires an equally large apple baker! I used a beautiful apple, a Crispin (Mutsu), that was locally grown in North Georgia mountains. These apples originated in Japan and are very similar to a Golden Delicious apple (which is what I would recommend using for the recipe if you cannot find a Crispin). The one I purchased was huge (weighed about a pound), so it served two of us. In fact, history says that the women who used to pick these apples called them “oven busters” because of their size. It didn’t exactly “bust” my oven, but you get the idea…they are big apples! If you use a smaller apple, be sure to reduce the cooking time. I like my baked apples a bit firmer and not mushy, so I tend to undercook them. I want a baked apple and not applesauce! Bake an apple (the house will smell so good! ), kick back, stay away from the malls during the Black Friday insanity and enjoy your weekend! Core apple, leaving about a one-inch space in the center of the apple for the filling. Also, peel about a one-half inch wide circle around the top of the apple. Mix together the brown sugar, pecans, raisins and cinnamon. Fill the core with the mixture. Top with the pat of butter. Pour the apple cider around the apple. Bakes at 375 degrees for 30-40 minutes, basting two or three times. Check after 30 minutes to see if apple if cooked through. I prefer when the apple is tender, but not mushy. Serve plain, topped with Bourbon Whipped Cream or good vanilla ice cream (preferably homemade). Looks delicious! Would love to see you explore the world of apples! Please, please visit and apple orchard “on the road”–am always on the lookout for the PERFECT pie apple. I like Jonathans, Pippins and Braeburns, but is sometimes hard to find local ones. And I find some “foreign” apples simply turn to mush when cooked…sometime next fall when you are up and around! I love the simplicity of a baked apple. We would wrap them in foil and put them in the hot coals and bake them on a camping trip. They were a HUGE hit. Of course, our apples weren’t as big as yours! I’m glad that you enjoyed your Thanksgiving…and that you were able to rest! I find it hard to do that during the holiday season…but you need it! I adore apples, and I love the simplicity of this recipe. I would be perfectly content with one of these beauties and a big scoop of icecream. I loved learning about this different apple variety too. Thank you for sharing, love! I love baked apples! Sometimes I make them with some extra sharp cheddar cheese mixed into the filling — sounds weird but it’s really good. Thanks for the recipe! Thank you for your comment. The purpose of the apple baker is to distribute the heat more evenly during cooking. 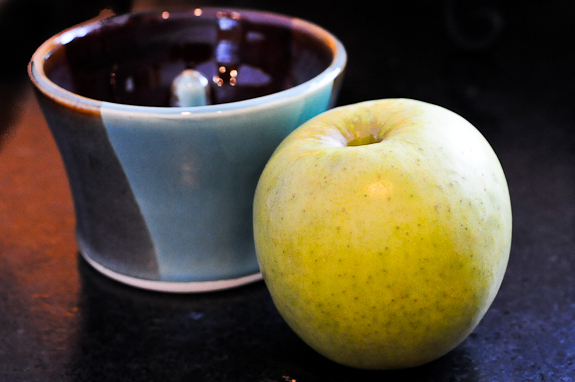 Since the stem of the baker is as hot as the rest of the pottery dish, the apple is cooked from all angles. I also think that that the apple holds it shape better when you use an apple baker. I hope that answers your question. 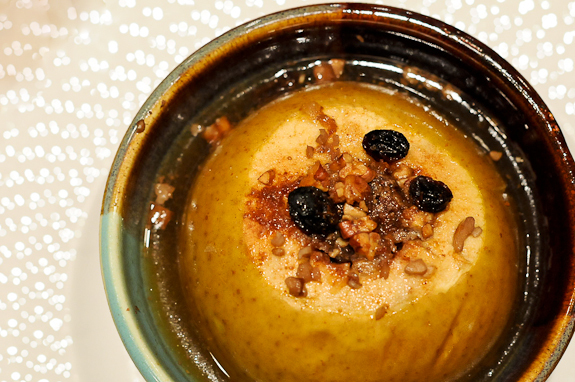 This is such an easy, elegant dessert! Thank you for sharing this beautiful creation. I have got to try this sometime! Gwen, this looks delicious! I’m ashamed to admit that we have an apple tree out back and I’ve neglected to post ANY recipes that use them. Now you’re inspiring me to play with my apples! I hope your recovery is on schedule, Gwen….and don’t overdo it!! This is a beautiful dessert! I have never seen an apple baker either, but I’ll have to look for one. Hope fully you get your cast off today! I’ve an award for you (The Versatile Blogger Award), please come and pick it up when you’re free. 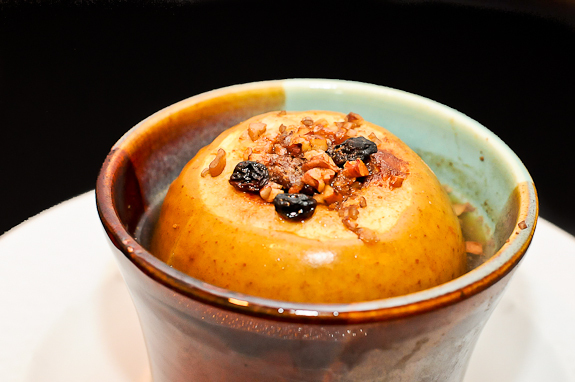 Baked apples are my all time favorite cold weather dessert and your pictures are making me drool all over my keyboard. Oooh I haven’t done baked apples in ages and I make mine like yours. Perfect winter dessert! Yours looks scrumptious and cozy. I love the apple cup. And hope you are almost walking normally again! That apple looks so adorable inside the little dish. perfect timing I have a ton of apples I just bought and this is perfect! I love crispin cant get them here! So jealous! Green Appletinis for a Holiday Blogiversary Celebration!